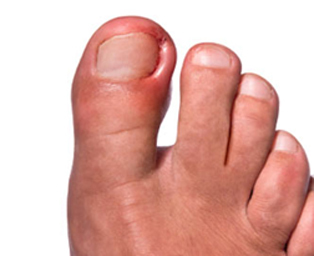 Ingrown toenails (or onychocryptosis) occur when the edge of the nail grows into the skin of the toe. They can be painful with redness and swelling around the nail. There are three stages of ingrown toenails. In the first stage the skin on either side of the nail is red and painful to the touch because of irritation, not infection. In the second stage the skin is infected and may bulge over the side of the nail which may ooze clear fluid or pus. In the third stage the skin has been infected for a prolonged time and is trying to heal itself. The skin does this by forming granulation tissue. This is heaped up extra red tissue that bleeds easily and migrates over the nail edge. Ingrown toenails are diagnosed clinically by their appearance. If pus is present, it may be cultured to determine the bacteria involved, but this is not always necessary. Infections that involve the bone or joint space may need to be ruled out with an X-ray, but this extent of infection is rare. Ingrown toenails are treated based on the stage involved. Toenails in stage 1 can be treated with warm soaks, a cutout shoe, and by elevating the nail with a cotton swab. Symptoms usually improve after a couple of days, but may not resolve for 2 to 3 weeks. Toenails in stage 2 can be treated with warm soaks and oral antibiotics. Closed-toed shoes and hosiery should not be worn for at least 1 week. If the toenail is especially painful, a portion of the toenail may need to be removed. This is done in the office under local anesthesia. Toenails in stage 3 need to be treated with partial or full toenail removal. For recurrent instances of ingrown nails, the nail bed can be ablated. This is done by placing phenol on a cotton swab and inserting it under the cuticle remaining after the nail has been removed. The phenol kills the matrix cells that make the nail plate. Soak your feet. Do this for 15 to 20 minutes two or three times a day in warm water. Soaking reduces swelling and relieves tenderness. Place cotton or dental floss under your toenail. Put fresh bits of cotton or waxed dental floss under the ingrown edge after each soaking. This will help the nail eventually grow above the skin edge. Change the cotton or the floss daily until the pain and redness subside. Use a topical antibiotic. Apply an antibiotic ointment and bandage the tender area. Choose sensible footwear. Consider wearing open-toed shoes or sandals until your toe feels better. Take pain relievers. If there’s severe pain, take over-the-counter pain relievers, such as acetaminophen (Tylenol, others) or ibuprofen (Advil, Motrin IB, others) to relieve the pain until you can see your doctor. Check your feet. 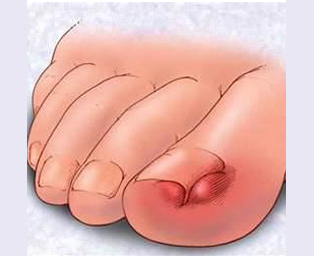 If you have diabetes, check your feet daily for signs of ingrown toenails or other foot problems. Surgical options include nail avulsion or matrixectomy. Avulsion results in the temporary removal of the nail plate from its attachments to the nail matrix, nail bed, and periungual skin folds. It can be performed in a total or partial fashion either as the primary procedure or as an initial step in the treatment process. Matrixectomy results in the permanent destruction of the matrix cells, thereby ending nail plate production. 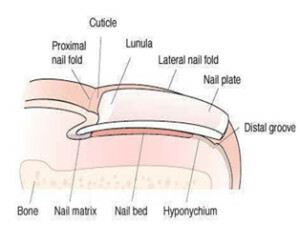 The entire matrix can be destroyed (total matrixectomy), resulting in the permanent absence of a nail plate, or only that portion of the matrix producing the offending nail margin can be destroyed (partial matrixectomy), resulting in a narrower nail plate. Chemical matrixectomy is the most common method used. A nail avulsion or matrixectomy is usually performed at the time of initial diagnosis and upon patient consent in our office. The procedure takes usually between 15 and 30 minutes. Explicit verbal and written post operative instructions will be given to patient upon completion of procedure. Patient returns to office one week after procedure for post operative follow up visit.